Low back pain problems occur in 60-80% of people at some time in their lives. Much of this relates to lumbar disc disease, either protrusion (bulge) or rupture. The disc is a layer of cartilage and fiber, about a quarter inch thick, that acts as a cushion between two vertebrae. It assists in twisting and bending movements, and prevents the deterioration of bone that would be caused by friction between bones. The discs make up 25% of the height of the spine. Their shrinkage causes most of the loss of height as people get older. Discs are subject to injury and wear. CT and MRI studies, but not x-rays, will visualize disc problems. 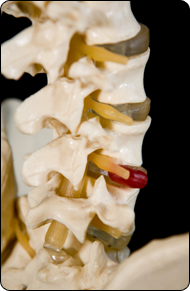 Ruptured discs, with entry of material into the spinal canal, are most common in people between 30 and 50 years of age. They are very painful, due to pressure on spinal nerves and release of inflammatory molecules from the disc itself and from white blood cells trying to dispose of damaged tissue. The pain may require narcotics for relief. Non-steroidal drugs are often effective, and should be used first. Risk factors for herniated discs include driving motor vehicles, sedentary activities, inactivity, vibration, smoking, history of pregnancy, obesity and tall height. Extremes of lifting or pulling heavy weights also lead to low back injury. Flexion of the spine is the motion most responsible for causing disc rupture. Therefore, in all physical activities it is important to keep the spine straight, and especially NOT to bend the spine while lifting. Surgery is often performed to remove part or all of the herniated disc, especially when lower lumbar disc rupture, usually the L4-5 disc, compresses a sciatic nerve root, causing debilitating pain to radiate down the leg. The natural history of ruptured discs, however, reveals that they often heal themselves without the need for surgery. Effective non-surgical treatments include epidural steroid injection, acupuncture, exercises, and physical therapy including ultrasound and electrical stimulation. In a one-year trial, 90% of patients had satisfactory recovery without surgery. Other studies reveal that low back pain is often related to abnormalities in the cervical spine, even in the absence of neck symptoms. Treating the cervical spine will improve low back pain over half the time. In my own experience, cervical chiropractic has been effective. Serial MRI studies of ruptured discs showed reduction of the herniated fragment 62% of the time. The larger the fragment, the more it shrinks. Physicians often believe that larger disc herniations are more suitable for surgery. However, these lesions are the ones most likely to diminish spontaneously, with a high rate of clinical improvement. Back surgery is expensive, disabling for long periods of time, and usually unnecessary. Since the symptoms often would have resolved by themselves, surgery offers the same success as a well-timed rain dance- it was going to happen anyway. My advice for those with low back pain, including ruptured discs: wait, follow conservative measures, and wait some more. Surgery is indicated for those with bladder or bowel complications of a ruptured disc, or significant leg weakness. The MRI appearance alone is not a sufficient reason to have surgery.